Big thanks to @thedrivingshow for having me on to talk about racing and my cafe racer build! Be sure to listen on Saturday at 11am eastern on stations nationwide and streaming on www.TalkRadioNetwork.com! This week we talk two wheels, coffee & wheels and NASCAR wheels! 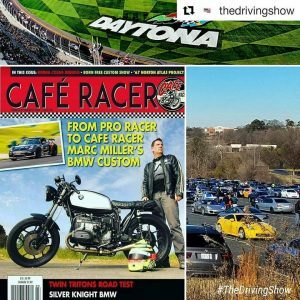 Racer #MarcMiller visits to talk about how he & his #BMW motorcycle wound up on the cover of #CafeRacer magazine. #NASCAR gets going this weekend at #Daytona as #SpeedWeeks continue. We check out the new rules sure to make things interesting. Plus, we visit #CarsAndCoffee and meet lots of characters and their rides. #TheDrivingShow his the airwaves Saturday morning at 11 eastern on stations nationwide and streaming from www.TalkRadioNetwork.com.